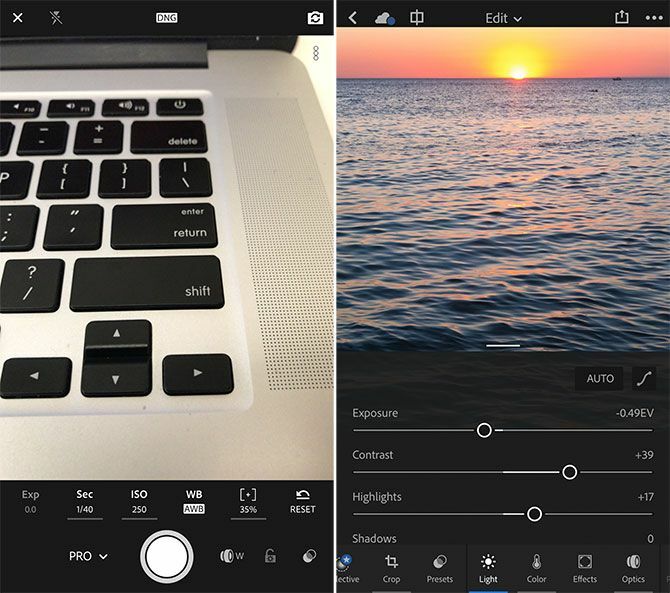 The feature that most iPhone photographers have wanted for forever is now here. With the right apps, device, and iOS 10, you can capture images in the RAW image format. These files capture and retain much more data than lossy JPEGs, allowing for better recovery of shadows and highlights, and more effective edits overall. The feature will only work on the iPhone 6s and above (including Plus models). These files are also considerably bigger than their JPEG counterparts, and you’ll need a third-party app to actually capture photos in RAW. 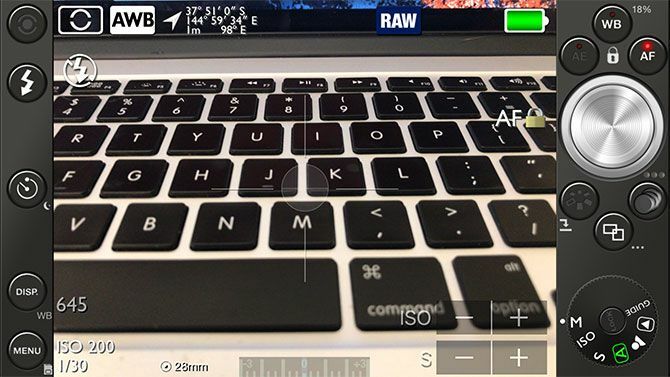 So here’s why you should (and how to) shoot RAW on your iPhone, and a few tips for doing so. RAW files aren’t necessarily “image files” in the same way that JPEGs are. Instead they’re a burst of raw data, hence RAW, which your editing program has to piece together. By changing various variables (like exposure, white balance, and so on) you will alter the outcome of the resulting image. When you want to use your image elsewhere, like share it online or send it to a friend, lossy JPEGs are still the way to go. Even when you’ve edited your image and decided to share it elsewhere, you’ll still be compressing the image. So by choosing RAW, you’re not shunning JPEGs, you’re just opening up more possibilities before you get to the sharing stage. We’ve written at length before about why you should be shooting in RAW format. The versatility on offer comes at the cost of space: in one comparison, a JPEG from my iPhone 7 Plus weighed in at 3.6 MB while a RAW cost me 11.3 MB. For that reason, you won’t want to leave your RAW files hanging around on your device, whether they’re kept in app storage or on your Camera Roll. iOS 10 uses the iPhone 6s, 7, and Plus model camera sensors to capture an uncompressed image in the Digital Negative (DNG) format. This standard was created by Adobe as a patented, open, but non-free image format for RAW photography. It costs nothing to implement, but it’s ultimately closed source with Adobe in the driver’s seat. And if you’re sitting there with a Samsung or Sony smartphone, it’ll delight you to know that Android users with compatible devices have been able to shoot RAW for a while now. Apple is playing catch up here. These free options are generally limited in scope, but they provide a good introduction to the medium without having to spend a penny. VSCO is probably the best free RAW camera I came across during my tests, but I’m not too fond of it as an editing environment. The camera itself offers a great deal of manual control over the things that matter: exposure value, white balance, ISO, shutter speed, and of course, full manual focus. You also get two-finger control to set exposure and focus zones independently, a grid for better composition, and a fast toggle between RAW and JPEG. The VSCO approach to editing isn’t everyone’s cup of tea. It’s not as instantly usable as other editors, and all the settings are hidden behind icons. There’s a good selection of ready-to-go filters, and all the usual editing settings are there if you look hard enough: temperature, exposure, and the ability to “save” shadows and highlights. The best part of VSCO is the ability to save your DNG files straight to the iOS Camera Roll (tap on the Profile tab, then hit Settings > Preferences and enable automatic saving). This allows you to export your RAWs using AirDrop, the cloud, or any other way you like to make edits using a desktop app of your choice. Verdict: Despite mandatory registration and a style-over-substance UI, this is my favourite free RAW camera for iOS. Good manual controls in the camera and a fast editor make it worth your time. 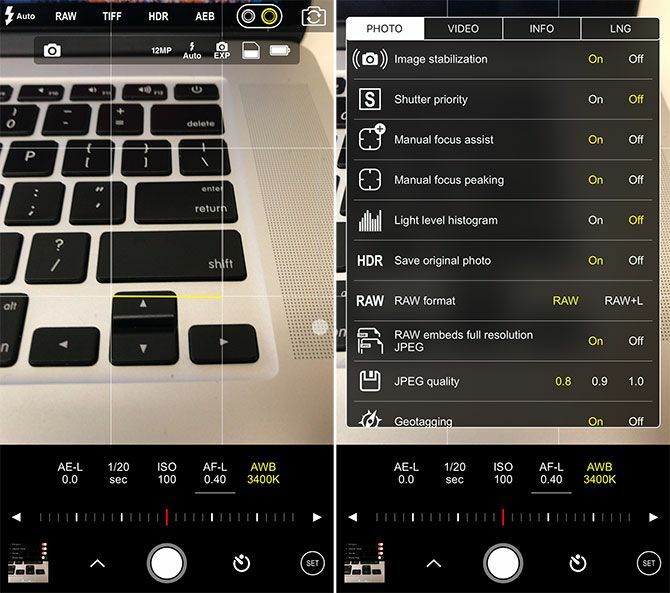 Just like VSCO camera, RAW by 500px is a completely free app that allows you to capture DNG files on your iPhone. And just like VSCO, you can save these images to your Camera Roll — but you’ll have to shoot first, and then choose Save Original to Camera Roll from the library screen, to do so. Unfortunately, RAW by 500px isn’t as strong as VSCO in either the camera or editing departments, but you can use it without signing up for anything, which is a bonus. The camera features two modes: simple, and not-quite-so-simple. In simple mode, you can only tap to focus and expose, with both functions locked to the area you designate. Tap the slider next to the shutter button and you’ll get a few more options: a slider for full manual control over focus, and a slider for exposure value. There’s also a timer, flash control, and a grid to help you better compose your shots. The app is lacking control for ISO, shutter speed, and white balance. Editing isn’t much better: everything is laid out in a decent enough fashion, but edits are slow and take a while to show up. It’s not a nice way to edit your photos. The app is strongly geared towards 500px, and makes the “shoot, upload, sell” workflow easier for those who need it, but as a camera and editor it’s not great. Verdict: A mediocre camera and editor that provides full freedom over the DNGs that you’ve captured. May be worth checking out if you’re a 500px user, otherwise VSCO or a premium app would be better. Lightroom is a flawed free choice for those wanting to dip their toes into RAW photography without spending any money on third-party apps. Despite providing a free RAW camera and editing environment, the only way to get your DNG files out of Lightroom is using the company’s own cloud service and a copy of Lightroom for Mac or PC. Check out the comments on this Adobe blog to see how well that decision went down. Anything you shoot in RAW within Lightroom must be edited and exported from within the app (you can get maximum quality JPEGs out, no problem) unless you want to cough up for a Creative Cloud subscription. There’s the inclusion of a decent editing environment if you’re happy to use it, and a camera with two modes: automatic and professional. You get full manual control over focus, ISO, shutter speed, white balance; a handy exposure lock button; and the ability to adjust exposure value too. The editor is rich with the sort of options you’d expect from Lightroom on a computer, complete with a few mobile-friendly presets for quick colorization. If you want to make selective edits using radial and linear selections, or get your photos out of the app, then you’ll have to sign up for Adobe CC. 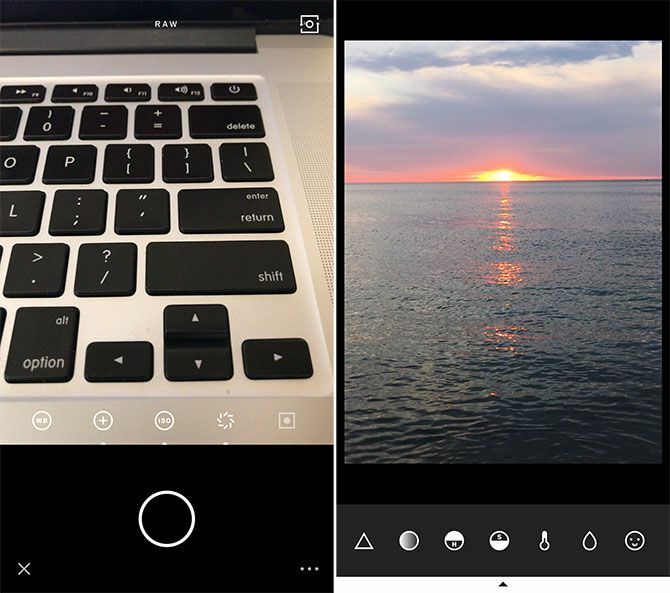 Free users can only export JPEGs to Camera Roll, other apps, or share directly to social platforms. Verdict: A free manual RAW camera and editing environment, with the deal-breaking drawback of having your RAW files stuck within the Adobe ecosystem. Probably worth keeping around for its editing abilities. Want to take your photography to the next level? Spend a few dollars on one of these for unprecedented control over your smartphone’s camera. Manual is probably my new favorite third-party camera app, and certainly my favorite premium RAW camera. The app takes a wonderfully simple approach to taking photos, with all of the important settings just a slide away. You can either shoot in assisted mode, which gives you control over exposure value, or use fully manual mode to set your own ISO, shutter speed, white balance, and focus. The touch-friendly interface invites you to scroll horizontally across the bottom of the frame to set the focus, complete with a zoomed-in preview of the focus area so you can get things just right. RAW photos are saved straight to your Camera Roll, while a handy grid, level, and real-time histogram make taking pictures a breeze. Finally, an adaptive theme finishes off the sleek look, switching between light and dark depending on your environment. There’s also a handy widget for quickly opening the app from the lock screen or home screen. Verdict: Pure simplicity meets RAW power, with all the controls you need and DNG files that go straight to your Camera Roll. No editing capabilities included. Like Manual, but with many more features. If you want an app with a sleek and simple interface but don’t want to sacrifice on features, then ProCam might be the app for you. It includes all the usual controls over ISO and shutter speed as well as the same “zoomed” manual focusing slider as the previous app, and it sends your RAW files straight to the Camera Roll. It also includes a bunch of extra modes, including Slow Shutter (pair with a tripod for best effect), Burst Mode, 3D Photos, Night Mode, and the ability to take videos. Crop your images to square or widescreen, overlay guides and grids, and configure the app just how you want it from the exhaustive preferences. My favorite feature is focus peaking, which highlights in-focus edges with a red outline. The app includes a Today screen widget too. Verdict: A strong app that packs in the features while trying to remain uncluttered and approachable. If you need a little more than what Manual offers, try ProCam. The original “everything including the kitchen sink” iPhone camera, 645 PRO wants to turn your iPhone into a mirrorless camera, complete with all the dials and menu options the developer could cram in. 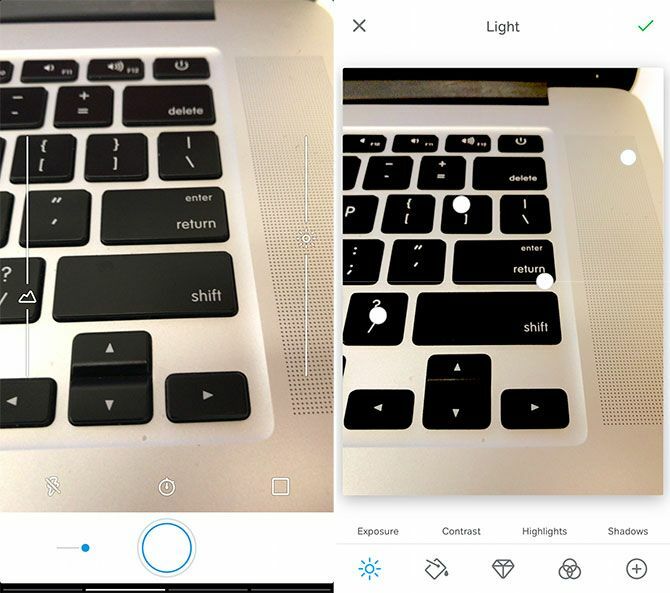 It would be easy to be overwhelmed if you’re not looking for a professional level of control, but if you want to push your iPhone camera to the absolute limit, then this is the app for you. 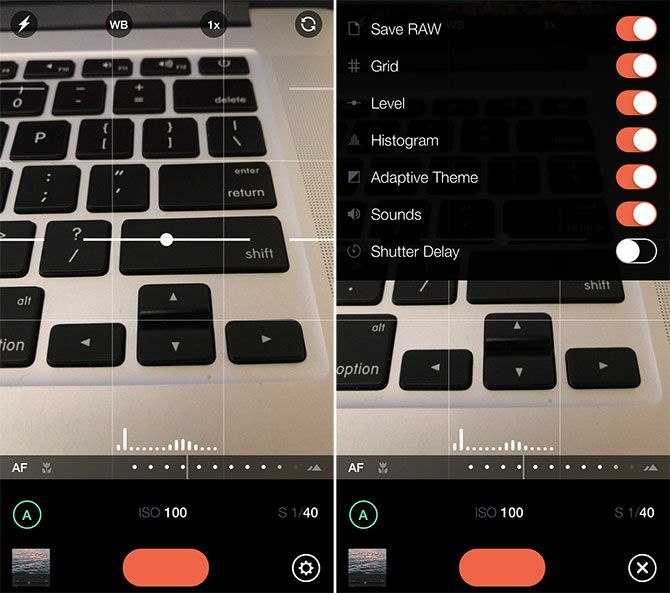 It’s not the most usable app on the list: there’s little in the way of sliders for changing on-camera parameters, and it will take some practice before you know what everything does. But the app is uncompromising in terms of features and supports a long list of third-party photo accessories (like the HiLO Lens, snappgrip, and iblazr). Some other notable features include focus peaking and the ability to capture both unprocessed RAW and JPEG files. One drawback is that the slowest shutter speed has been reduced to 1/3 second. Verdict: Overwhelming for newbies, but it’ll bring a smile to your face if you want to push your iPhone camera to the limit. See also: PureShot ($2.99) from the same developer. It’s basically the same app with a slightly simplified UI for $1 less. Your iOS Photos app doesn’t render RAW photos, so instead many apps will embed a JPEG into the DNG and Photos will display that instead. It’s also not possible to tell what file type an image is from the app, which can be problematic if you want to delete your massive RAW files after transferring them. 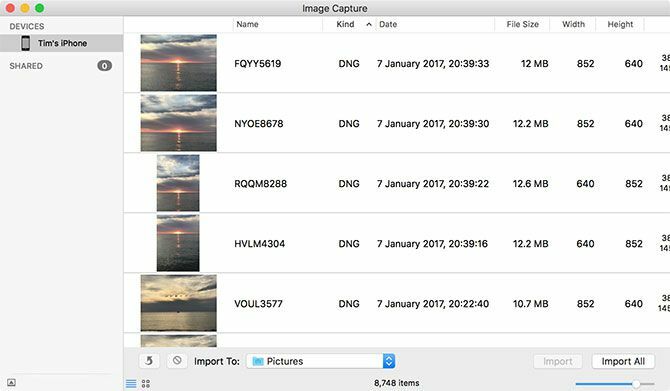 If you’re a Mac user, you can use the Image Capture app included with macOS to choose your iPhone, list files by type, then save and delete the DNG files. One other telltale sign of a RAW file is a low-quality JPEG embed. Many RAW apps include a small JPEG to keep the file size down, which can be a giveaway when browsing your files. It’s generally best to transfer your images to a computer and edit them there. Many photo editors on the iPhone have awkward interfaces that get in the way, and the small screen isn’t conducive to accurate editing.